Beautiful Victorian Elegance Necklace is A Double Strand Designer Piece, 18″ & 24″ long. This Vintage Inspired Necklace is made with Antique Silver Findings, Chains, Barrel Clasp, and Floral Cabochon Setting. We use a dark green and lemon-lime Jade Beads, Green Pearl Beads, and Green Serpentine Beads. The Green & Cream Victorian Lady Cameo is embellished with Emerald Swarvoski Crystal necklace and earring. This necklace is another Designer original from Jewels Designs, Necklace Shop. The peace would make a fantastic Mothers Day and/or Birthday Gift, and it’s now half price! Check out this piece and all of our other art designs at Jewels Designs. One-of-a-kind. Beautiful Blue Moon Bracelet, is 7.5″ long (standard size) and is made with Antique Silver Findings, Connectors, Toggle Clasp Cobalt Blue Jade Beads and a 12mm Cobalt Blue Opal Cabochon. Another Designer Original from Jewels Designs Gift Gallery Shop. This one-of-a-kind piece would make a fantastic gift and can be worn with any outfit. Check out this art piece and many other Designer Originals at Jewels Designs. Cha Cha Cha!!! I absolutely love these earring!!! Black Mambo Earrings, are 3″ long, and made with Antique Silver Findings, Connectors, Beadcaps, Hook Earwires and Black Glass Beads. 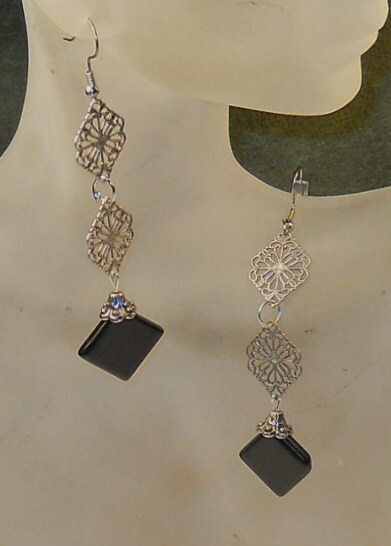 This pair is another Designer Original from Jewels Designs and is part of our Black Velvet Jewels Line. These would look fantastic with that simple black dress, add a necklace from one of our other Lines and you’re good to go! And…..by all means wear them out dancing!!! Check out these and all of our other pieces at Jewels Designs.